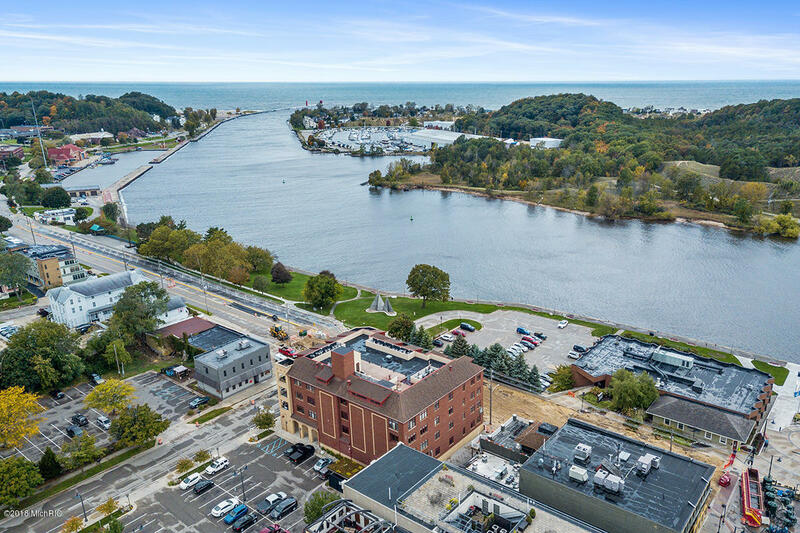 Incredible views atop the high-demand Zephyr condos overlooking the channel leading to Lake MI. Within walking distance to all Grand Haven offers. This 2nd floor unit affords 2 bedrooms, 2 bathrooms, 1 w/ a large glass standing tile shower, the 2nd w/ a whirlpool tub. Pristine kitchen offers large island w/ double sink, stainless appliances, white soft-close cabinetry large windows & amazing views of the channel & Dewy Hill. Living room w/ gas fireplace, built in home audio, in-home fire sprinklers & sliding door to private covered patio. Low heating/ cooling costs due to location, Secure stair/ coded elevators. Common areas include roof top patio w/ grill, storage areas and parking spot in heated basement garage. Close to it all, call today for private tour!